NASA astronaut Garrett Reisman has quit the space agency to join up-and-coming private spaceflight company SpaceX. Reisman will work at the SpaceX (Space Exploration Technology) company headquarters in Hawthorne, Calif. as a senior engineer working on astronaut safety and mission assurance. "I saw what was going on in the commercial space area and I really believe strongly this is the future of human spaceflight and I had a strong desire to get involved with that," Reisman told SPACE.com. "That's really what led me to make this decision, which was not an easy one to make." Reisman is one of at least three NASA astronauts to retire this year – the others were Marsha Ivins and Jose Hernandez – as the space agency winds down its space shuttle program. Only two more shuttle flights are planned before the fleet is retired and NASA transitions toward planning for missions farther out into the solar system. The company already has more than $2.5 billion in launch contracts for flights over the next few years, and recently announced plans to double the size of its rocket development facility in McGregor, Tex. Reisman said leaving NASA's astronaut corps, which he joined in 1998, was bittersweet. 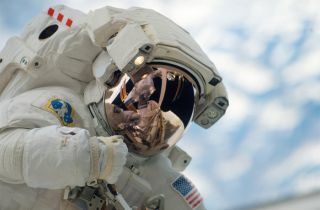 "Being an astronaut, I'll be totally honest with you, is the coolest thing ever and a very, very difficult thing to walk away from voluntarily," he said. SpaceX was started by millionaire Elon Musk, who co-founded the Internet payment service PayPal and also currently leads the Tesla electric car company. The company achieved an unprecedented success in December 2010 when it launched its Dragon space capsule – the world's first commercial space capsule – into low-Earth orbit atop a Falcon 9 rocket, and then recovered the spacecraft successfully from the Atlantic Ocean. "We’re excited about the great team that we are building," Musk said in a statement. "Our talent is the key to our success. Garrett's experience designing and using spaceflight hardware will be invaluable as we prepare the spacecraft that will carry the next generation of explorers." SpaceX has a $1.6 billion contract with NASA to use Dragon and Falcon 9 to launch cargo to the International Space Station after the space shuttles retire. The company also hopes to outfit the Dragon to carry humans, and eventually transport both astronauts and space tourists to orbit. Reisman said he was impressed by the firm's orbital achievement with the Dragon capsule last year, but his decision to join SpaceX was sealed when he learned of the "secret" cargo the company had packed onboard Dragon for its maiden flight. "They flew some cheese in space, which I thought was really cool," Reisman said. Reisman will be working directly under another former NASA astronaut, Ken Bowersox, who now serves as SpaceX's vice president of astronaut safety and mission assurance. Bowersox's team will do the work to transform the current Dragon cargo model to a capsule with life support systems, seats, lights and all the other creature comforts necessary to host humans. "My job is all about trying to make the Dragon and the Falcon as safe as possible so we can put people onboard," Reisman said.